We’d love your help. Let us know what’s wrong with this preview of The Queer and Transgender Resilience Workbook by Anneliese Singh. Resilience is a key ingredient for psychological health and wellne How can you build unshakable confidence and resilience in a world still filled with ignorance, inequality, and discrimination? 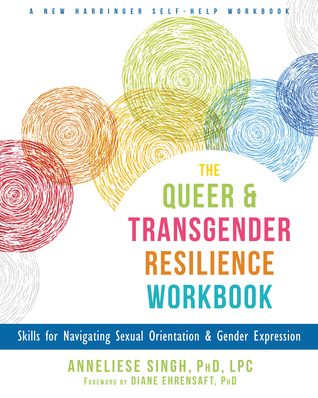 The Queer and Transgender Resilience Workbook will teach you how to challenge internalized negative messages, handle stress, build a community of support, and embrace your true self. 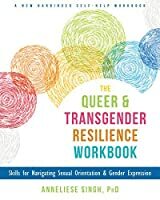 To ask other readers questions about The Queer and Transgender Resilience Workbook, please sign up. This was actually quite a thorough, interesting read. It gave me a lot to think about and a lot of help therapeutically. I think people should definitely give this a look when it comes out in February. This is one of those books that are definitely needed in the queer community. This book deals with self-respect and how you can get motivation to keep going. I have to say that this would be perfect for people who have just come out or are thinking of coming out because it deals with many things that could be beneficial for those people to know. There were a few things that surprised me. The first one is that is written by a nonbinary person, which is honestly great because it's hard to find book This is one of those books that are definitely needed in the queer community. This book deals with self-respect and how you can get motivation to keep going. I have to say that this would be perfect for people who have just come out or are thinking of coming out because it deals with many things that could be beneficial for those people to know. There were a few things that surprised me. The first one is that is written by a nonbinary person, which is honestly great because it's hard to find books written by nb writers. The second one is that it mentions asexuality, aromanticism and pansexuality, which is something that rarely happens in more academic and serious writings about sexuality and identity. The third one is that it acknowledges nonbianry genders, which is absolutely amazing. The fourth one is that it focuses on intersectionality, this makes sense because the writer is a person of colour but it's great seeing it acknowledged. This workbook focuses on many things that go through your mind when you are thinking of coming out or you have just come out but I feel like it could also be used to help improve the different associations that already exist. I think this is the case because of the importance that it gives to intersectionality and the different identities that exist in a person. This could be really useful to work through in smaller communities in order to make sure that everyone feels welcomed. There is something else that has won me over, even though it's not actually very important to the content. The author criticises Dan Savage, which is something that I live for because he always seems to forget intersectionality and privilege in everything that he does. Also, he tends to dismiss new identities. This workbook can be very useful. I really love the idea of this book! The workbook has tons of activities and worksheets that make it easy to categorize who you feel you are, and seeing these labels and descriptions in front of you can truly help those who are struggling to define themselves. Personally, this is a workbook that would have helped me a lot in high school, but now I'm more secure in my identity and these worksheets were more reinforcement than help. I also like that there were sections about more than just queer i I really love the idea of this book! The workbook has tons of activities and worksheets that make it easy to categorize who you feel you are, and seeing these labels and descriptions in front of you can truly help those who are struggling to define themselves. Personally, this is a workbook that would have helped me a lot in high school, but now I'm more secure in my identity and these worksheets were more reinforcement than help. I also like that there were sections about more than just queer identity. It really takes the reader through a personal journey of discovery. One criticism I have is in the title: transgender people are queer because they are transgender. So saying "queer and transgender" is redundant and unnecessary. Overall, I highly recommend this book to anyone struggling with their identity in any way, shape, or form. I'm always happy to read an #OwnVoices book, and this was no exception. Disclaimer: I received this book from netgalley in exchange for an honest review. There are quite a lot of things to mention about this book, yet at the same time, I'm not quite sure how to word them all. As an educative work on queer identities, it does an exellent job, not only in what it teaches, but also in whom it includes. The book exells in it's intersectionality, and with an identity inclusion only topped by Ash Harde I'm always happy to read an #OwnVoices book, and this was no exception. Disclaimer: I received this book from netgalley in exchange for an honest review. There are quite a lot of things to mention about this book, yet at the same time, I'm not quite sure how to word them all. As an educative work on queer identities, it does an exellent job, not only in what it teaches, but also in whom it includes. The book exells in it's intersectionality, and with an identity inclusion only topped by Ash Hardell's The ABC's of LGBT. I wouldn't say it's, as they say, "all-inclusieve", as there are quite a lot of identities out there, and it might be difficult to fit them all in one short book, but overall it felt good to find a text covering so many different experiences. It's not all-compasing, but really quite inclusive. In adition, all the information is presented in a manner that feels neither dry not academical, but rather friendly, and easy to understand. I did, however, also come across several things I was less pleased with, though not all are neccecarily to blame on the author. The ebook can only be discribed as poorly planned, or at least porely executed. It's quite clear that the book is meant to be read in it's physical form, leaving pretty much all the workbook tasks looking squed, out of order, and difficult to understand. I also failed to find even a single picture throughout the book - which is nitpicky, I know, but it feels odd to me that a workbook, and a queer one at that, should be nothing but a wall of text. Also, whilst there were several things I loved about the book, it felt a bit like "Baby-Queer's First Self-Help Book". Not that that's a bad thing at all, as I would have adored to have access to such a fundamental overview over a queer experience. Now however, as I have already made it past most of what the book learns on my own, it probably has less of an inpact than it could have had. This #ownvoices LGBTQ-focused self-help workbook is encouraging and hopeful, while still helping people work through LGBTQ-related stressors. It's also intersectional, although a bit of ableist language does sneak in. The case studies were especially helpful, and I would have liked to read more of those in the latter chapters of the book. Singh's book would be a great resource for leaders of LGBTQ support groups for teens and adults alike. I got a copy of this from Netgalley in exchange for an honest review. Overall I liked this workbook. It's original and useful. I think it is worth investing in. The last point is my favorite and the reason this book got such a good rating. It addresses how your LGBTQ identity is a part of your larger sense of self and mixes and mingles with all your other identities which also must be built up and I got a copy of this from Netgalley in exchange for an honest review. The last point is my favorite and the reason this book got such a good rating. It addresses how your LGBTQ identity is a part of your larger sense of self and mixes and mingles with all your other identities which also must be built up and explored and I haven't seen much of that from workbooks in the past! a) I am reading this as an ebook and the exercises are not formatted correctly, some of them - like the likert scale ones - to the point where you can't really read them in a coherent way. This was the biggest problem for me. d) No pictures or colors, which surprised me for a workbook and made it harder to get through. A fantastic workbook full of relevant information and useful written practices. You will want to have your marking pen in hand to highlight parts that really speak to you. This workbook is written with clarity and fluidity. Each chapter moves easily from one concept to another in an easy to understand format. You can easily work through this on your own and/or use it as a tool to begin some important conversations. The author shares personal experiences which help solidify many of the topics as wel A fantastic workbook full of relevant information and useful written practices. You will want to have your marking pen in hand to highlight parts that really speak to you. The author shares personal experiences which help solidify many of the topics as well as making the material more personal. I don't have much to say about this book. It was interesting and I learned aa lt about myself in manly I do not have great social support of other people who are trans. There are ten aspects of this book for one to complete to get a full look at your overall identity that includes more than just your LGBT status. This includes things like age and what inspires you. Overall it got me thinking and I just gotta think if I am going to keep or sell this book. A great book for young queers, although it is centered on the American queer experience. As a non-American reader, it feels a little difficult for me to relate on some parts of the book as my experience and the power relations behind some of these labels are just different from the ones being told in the book. But in overall, it's a very empowering book and I'm glad I've got my hands on it! Not what I was expecting but still a good resource and still very helpful. This insightful #OwnVoices nonfiction resource would enhance any collection of therapeutic tools, as Dr. Anneliese Singh brings both personal and professional understandings to this book as a multiracial South Asian Sikh non-binary femme psychologist!